The June 3D Print of the Month is different than those of the previous months: I had the chance to borrow a Form1 3D printer from a friend and I have been putting it through its paces over the last few weeks. Naturally, I also used the Form1 to print the 3D print of June, a Yoda shaped vase. The Form1 is a stereolithography (SL) 3D printer that works in a completely different way than Fused Filament Fabrication printers: stereolithography is an additive manufacturing process that creates or prints a solid object layer by layer. Contrary to FFF however, stereolithography does not melt a polymer filament in order to liquify it before printing a 3D object. SL works by hardening an already liquid resin, contained in a resin tank, into a solid object. The resin, a so-called photopolymer resin (expl) is cured by an ultraviolet laser beam. For each layer, the laser beam traces a cross-section of the part pattern on the surface of the liquid resin. Being exposed to the ultraviolet light hardens the pattern traced on the resin, joining it to the layer below. I have been printing something new on the Form1 every day over the last couple of weeks. What strikes me about the SL machine is how easy it makes it to print complex 3D models. The Yoda vase with its complex, detailed shape combined with severe overhangs makes a perfect show case for the capabilities of the Form1. This 3D print of the month is not supposed to be an in-depth review of the Form1. 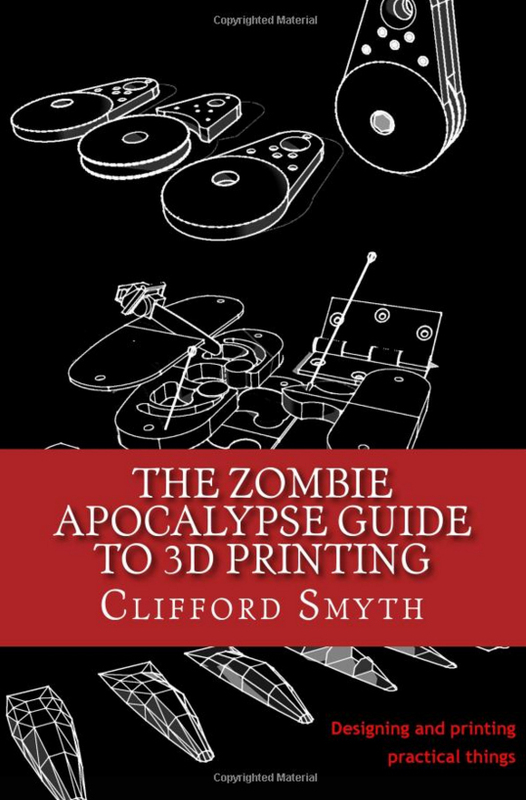 While that is in the works too, this blog post is rather to give you a taste of how you 3D print using an SL printer. The source file of the Yoda vase is found on Thingiverse under a Creative Commons – Attribution ShareAlike license. 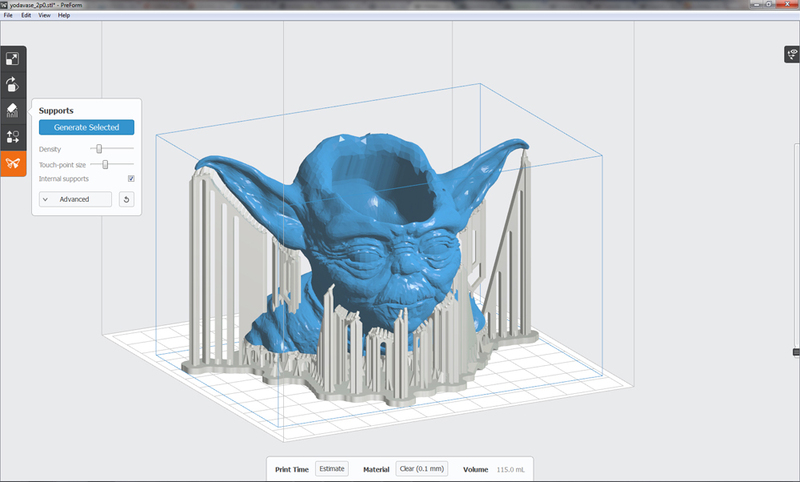 While there are many Yoda 3D models on Thingiverse, this particular one has been create by user Yay. 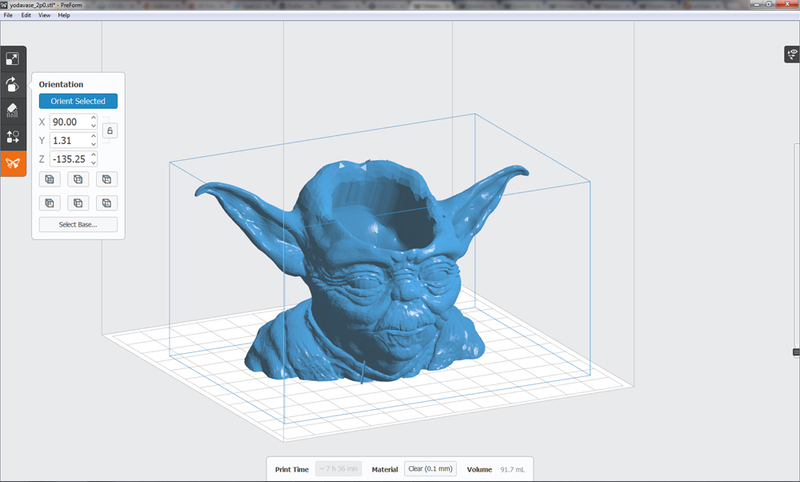 Yay used Meshmixer (a tool to create 3D mashups and remixes) to carve out Yoda’s head in order to create the vase. While playing with Meshmixer he added a small figurine inside the head. In case you are wondering why, the intention was just to show how easily this is done with Meshmixer, it has no deeper meaning. The Form1 comes with its own printing/slicing software called PreForm. PreForm is extremely easy to use, it actually has a lot fewer settings that you can tweak compared to Cura for example. Having loaded the Yoda vase .stl file into PreForm, I set the resolution to 0.1mm, the lowest resolution setting. Despite that I chose the ‘lowest’ resolution, the print time was calculated to be a whopping 7h 36mins with the print consuming 91.7ml of resin. Once the supports were in place I let the Form1 get to work. 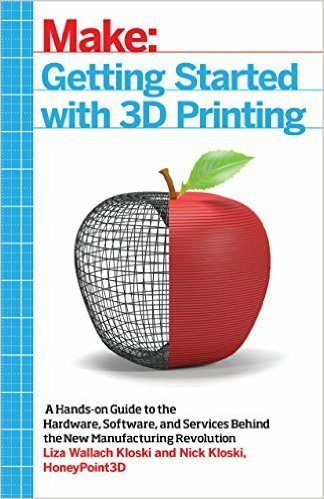 What’s neat with the Form1 is that the sliced 3D model is actually transferred to the printer such that you can disconnect the printer from the computer and let the 3D printer work autonomously. Given the almost 8 hours of printing time, I let the Form1 work over night. Based on prior experience I knew this would not be an issue provided that you get the print to stick on the build platform. This was verified easily enough about the first half hour of printing. The only other thing I had to make sure of was to fill the resin tank was filled with sufficient resin such that the printer could complete its job. The next morning I found the completed Yoda vase print attached to the Form1’s build platform, everything had gone according to plan during the night. While the 3D printing process is very easy with the Form1 SL printer, the post processing takes quite a bit more work. The first thing I had to do was to pry the print loose from the print platform. Using a spatula I managed to do so but had to apply some force as the prints tends to stick very well to the build platform. What makes the post processing of SL prints more difficult is that everything is still covered in the sticky photopolymer resin. You should not touch the resin, thus wearing latex gloves is highly recommended. As a next step, Yoda had to be washed in a bath of 90+% isopropyl alcohol in order to remove any liquid resin residues. 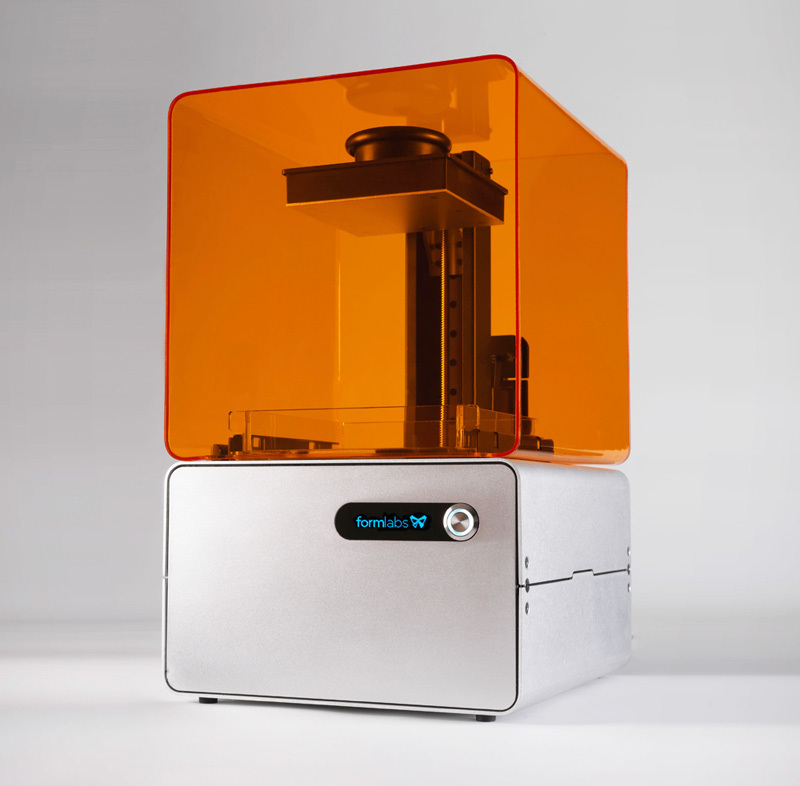 FormLabs provides an entire post-processing kit that comes with a handy rinse tub. I gave Yoda a 10 minute bath in the isopropyl alcohol before letting him dry. I then set to work on removing the support structures using a pair of pliers. Having removed the largest chunks of support material I did the finishing of the finer remaining bits with a cutter. Finally, I sanded the touch points with fine sandpaper to remove any last traces of the supports. I then spray painted the Yoda vase with gray acrylic-resin primer to give it its final finish. Painting the vase revealed that it contained a couple of wholes that were not so easy to spot when the surface was still in transparent resin. The paint coat also revealed some other slight imperfections that I could have sanded away if I had been aiming for a perfect surface finish. The lessons learned and the insights gained from the June 3D Print of the Month are manifold. Never having used an SL 3D printer before, working with the Form1 was a totally new 3D printing experience. Summarizing everything I learned would by far outstretch the scope of this blog post hence why I’ll post a in-depth review of the Form1 soon. Still, I’ll leave you with my predominant impression of the Form1: effortless precision! Do you like the 3D Print of July? Do you have any experience in working with SL 3D printers? Let us know by leaving your comments and feedback below.